If you like a bit of history and architectural mystery with your holiday, 324 Main Street, Vineyard Haven, is a good place to stay. Originally a family home, 324 Main Street was built by Holmes Swift and his wife Rhoda around 1900, on land purchased from the Daggett family. Holmes Swift was one of the founders of what is now SBS The Grain Store on State Road and his son Frank ran a clothing store in Vineyard Haven. The house has grown and changed in many ways over the years. Fortunately, as the owners made changes, they left bits of what was previously there, giving us useful clues as to what each room may have been used for and what it might have looked like. The house returned to the extended Daggett family in 1923, when it was acquired by Thomas Rabbit, a local hotelier who was married to Bernice Daggett, from Rhoda Swift, by then a widow. The first addition to the house was probably the room where we have the large oak dining table, the front staircase and the front bedroom. It’s unclear whether this was done by the Swifts or by the Rabbits. The second extension, the distinctive stone verandah was added by Mr. Rabbit, who used the house as an annex to his successful Tashmoo Inn, which was located near the corner of Tashmoo Avenue and Main Street. The fireplaces and the original heating system were probably removed at this time, as the intention was only to use the property in the summer. The original parlour, now used as a storeroom off the kitchen, was turned into an additional bedroom and the larder was turned into what is now a shower room. Sadly, Mr Rabbit’s main business, the Tashmoo Inn, burned to the ground uninsured on Sunday, June 8th, 1958. There are some images of the hotel before it was destroyed, during the fire and afterwards here. The hotel was never rebuilt but a restaurant called the Sandpiper was constructed and run by the Rabbit family on the site, which is now the Montessori School. The Tashmoo Annex, as 324 Main Street was then known, continued to be run as a summer boarding house despite the loss of the hotel. In August 1969, Thomas Rabbit sold the Annex to his daughter Marjorie (Marge) and her husband Vincent Rusbosin, who kept up the summer boarding tradition here throughout their lives, welcoming many of the summer guests back year after year. Marge hosted a wide range of visitors, gaining friends and admirers for her genuine, practical and helpful manner. In February 2009, we bought the property from the Rusbosin estate and continued this long tradition of summer boarding residency, welcoming many of Marge’s guests back for two summers, along with new guests from around the world. Unfortunately, the expense of running the house as a commercial enterprise outweighed the return and in 2011 we gave up the boarding aspect and decided to keep the house as our second home, occasionally renting it out to families and their friends who would enjoy its comfort, history and excellent location, while we worked our way through the regeneration process. We believe one of the exterior walls of the original house was the front wall of the room just off the kitchen, where one of the chimneys is located. The front door of the house at this point may have been where the kitchen stove is now. The was access to the house from a path through to Locust Lane. At some point, the south side of the house (towards town) was sheathed in aluminum siding, straight over the old shingles. This will eventually be taken off and the house re-shingled after we re-wire, re-plumb and insulate. We are looking for a way to do this from the outside rather than taking down all the walls inside as we’d like to retain as much of the original lath and horsehair plaster as we can. We think at least part of this room was an original kitchen. Apparently there was a door to the left of the stove – you can see where it would have been from the outside, if you look up to the roof peak then down to the ground it was likely to have been along that line, roughly where the stone bedroom meets the old house. That may have been the original front door. No idea why they fitted the kitchen units so close to the bathroom and left a gap at the other end – maybe a special deal on cabinets and this was the only way to work them in? We’ve added a plumbed in dishwasher and a microwave which makes it a more convenient kitchen space. It’s also odd that the south side of the house has so few windows – another anomaly we will remedy eventually so that we can make best use of passive solar heat. We understand from a relative of the Rabbits that this room was originally a larder – if you look to the left and right of the shower stall at the top, you’ll see two shelf supports that weren’t taken out when the bathroom was created. Annoyingly, they must have thought that having sinks in every room was enough and that one wasn’t needed here or in the other bathroom off the kitchen. This is not a successful conversion and we won’t be keeping this shower room, but it is clean and has an excellent water saving nozzle. Because of the lovely outdoor shower, we don’t use this one too often. When you do shower here, you’ll want to keep the window open as there isn’t a fan. This may remain a bathroom, with a new laundry and mud room built next door. We’re definitely keeping and refurbishing the footed tub. Adjacent to the kitchen, this was probably the original parlour – it still has the plate rail along the top of the wall (we will be keeping this) as well as the original 1900 windows which we’ve restored and treated with linseed oil. For warmth, we’ll install secondary glazing which can be removed in summer. It also looks as though there was a wood burning stove in this room, that shared a flue with the kitchen stove. You can see the chimney in the basement and on the roof – but no fireplaces exist at the moment. Used as a bedroom during the boarding house years, this room is now the ‘snug’, a cosy place to watch television or play games. This double bedroom on the north side of the house was named for the first whaling captain from the Vineyard. Until we had the old linoleum and many layers of paint striped off in May 2011, this was a rather dark room. It’s now quite bright and pleasant. The 1900 windows in this room have been stripped, repaired and treated with linseed oil. We’ll install a form of secondary glazing to ensure this room stays warm in winter. 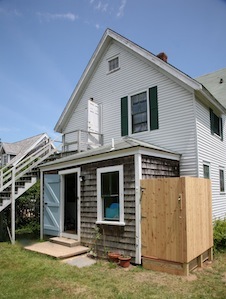 Until we take off the exterior siding, we won’t know how much of this area (now accessed by the exterior back stairs) was part of the original house. The attic and cellar, which usually give good clues about how a building evolves, don’t give much away here. At some point, probably at the same time or soon after the new staircase went in out front, the very steep back staircase was removed and its landing turned into a bathroom for this bedroom. This double bedroom on the south side of the house was named for the first black sea captain in America, from Edgartown. The unusual closets in this room don’t make much sense (look at the direction of the floor boards) – they appear to have been carved out of the front bedroom, which was added later. The chimney runs through the first closet and the remains of a hole for a wood stove which may have heated the front bedroom can be seen. We had the old linoleum and many layers of paint removed from the floors of this bedroom in May 2011, revealing the beautiful pine for the first time in over 100 years. While probably part of the original house, it’s not clear whether or not this was originally a bathroom. Named for the family that built the original house in 1900, this single bedroom was probably part of the original house. We had the ancient linoleum and many layers of paint removed from the floor here in May 2011, revealing the beautiful pine floorboards. The current plan is to keep this room as a bedroom as it has an original exterior wall. This is likely to have included the area where we have the large oak dining table, the staircase and the front bedroom upstairs. A double room with two twin beds on the east side of the house closest to the water. This room is named for one of the earliest settler families on the island. The large stone extension to the property happened sometime after the Rabbit family bought the property in 1923. A family member recalls seeing wagon loads of stone brought here to build the extension from a family property in the middle of the island. This extension encompasses the large front hall and sitting area and three bedrooms. This double bedroom with two twin beds at the front of the house, on the north side, is named for the first governor of the island, originally from Tisbury, Wiltshire. This double bedroom with two twin beds at the front of the house on the south side has a door to Rusbosin (Bedroom 3) which can be opened to make this an excellent family suite. It’s named for the family which originally owned the land. This double bedroom with a king size bed on the south side of the house is named for the previous owners, Marjorie (Marg) and Vincent (Russ) Rusbosin. It’s much sought after not just for the larger bed but because it has seven windows. These windows, and those in Daggett which connects to it, were the first windows to be refurbished and where we trialled the linseed oil treatment we’ve used on the rest of the windows that are being refurbished.